Thank you for your interest in volunteering with Solano Land Trust! Volunteers are vital to our work. We offer flexible scheduling and opportunities both indoors and outdoors. We have an office in Suisun City and five major properties in Solano County: Jepson Prairie, the King-Swett Ranches, Lynch Canyon, Rush Ranch, and Rockville Trails Preserve. Looking for a way to fit exercise, fresh air, and volunteering into your schedule? 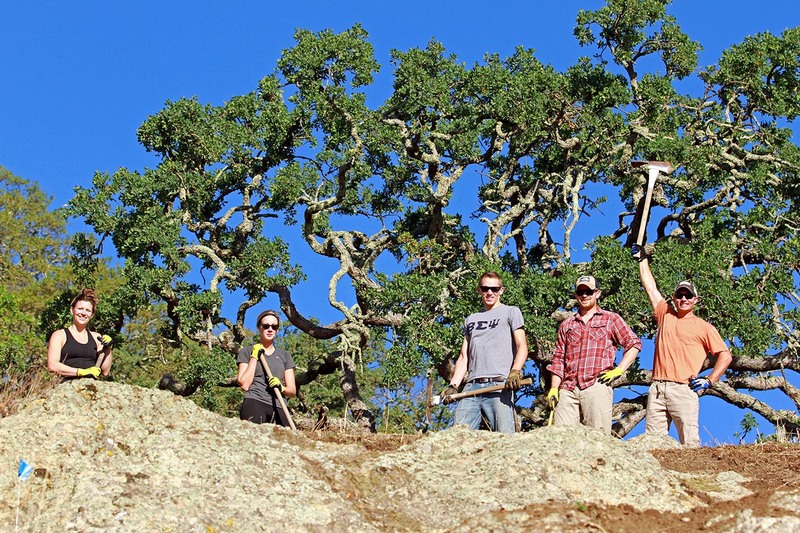 Join Solano Land Trust's trail crew! Become part of a crew who helps us care for trails, fences, gates, and other infrastructure on the 10,000+ acres of land we own and protect in Solano County. The team typically works from 9am to noon at Lynch Canyon on second Saturdays of each month. Note: This is physical outdoor work. There is usually no shade. Be prepared to be outdoors for approximately three hours using hand tools like shovels and hoes; lifting, carrying and lowering supplies; bending over, squatting and kneeling on dirt, grasses and weeds; and sweating. To get involved, contact Jordan at jordan@solanolandtrust.org or 315-262-4090. Volunteer for partner organizations who do great work on Solano Land Trust lands! Rush Ranch Educational Council: contact Mary at taksan@comcast.net or 707-422-4491. Access Adventure: contact Michael at 707-999-1419. Do you enjoy doing physical outdoor work on a ranch, and are you available for 30-45 minutes one or more mornings and/or afternoons a week throughout the year? If so, become a volunteer with Access Adventure to help them feed their horses. You'll be trained on safety procedures to keep you and the horses safe, and on the quantity of hay, alfalfa and supplements to use. You'll then join Access Adventure's horse feeding team. The horses are fed twice a day everyday, once between about 6:30 and 8:30 a.m., and once between about 3:30 and 5:30 p.m. Any availability is helpful, but the greatest need is on Monday and Wednesday mornings and Friday afternoons. contact Tom at tmuehleise@aol.com or 707-439-5264. Do a search for "volunteer opportunity" on our calendar to learn how you can help us get things done. Contact us to inquire about other volunteer opportunities or to share ideas of your own at 707-432-0150 or volunteer@solanolandtrust.org. Eagle scouts have a long history of doing great projects for Solano Land Trust! If you're interested in doing an eagle scout project for Solano Land Trust too, contact Jordan Knippenberg at jordan@solanolandtrust.org or 315-262-4090. Ask him for a list of project ideas. When you meet with Jordan to get his sign-off, be sure to give him pages 9 and 10 of Solano Land Trust's volunteer policy, signed by you and your parent or legal guardian. Thank you for all you do! For resources and to let us know about your volunteer contributions, please contact us at 707-432-0150 or volunteer@solanolandtrust.org.